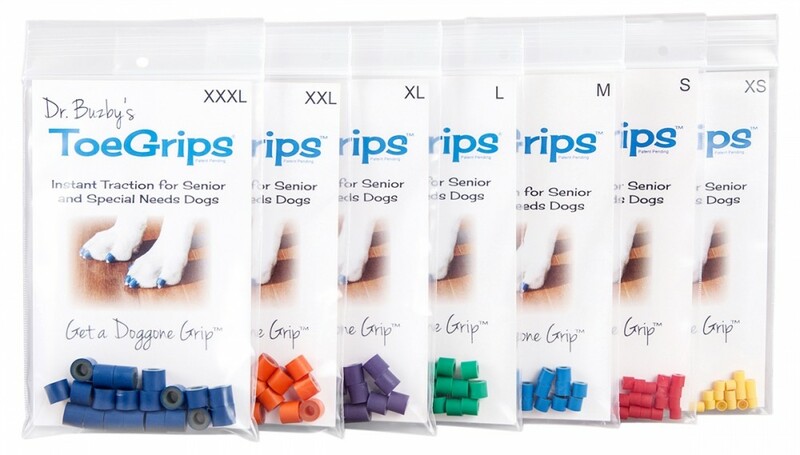 Developed by veterinarian Dr. Julie Buzby, ToeGrips for Dogs was designed for senior, arthritic, and special needs dogs. ToeGrips enable your dog to get up without struggling and walk without slipping. They were designed for slipping/weak senior dogs, but may also be helpful for disabled and rehabilitating dogs. ToeGrips are a biomechanical solution to a biomechanical problem! They actually affect the brain, stimulating it to pay more attention to the paws. ToeGrips create proprioceptive stimulus which is perhaps the most critical mechanism to help dogs avoid injuries and regain their mobility.